Anna Louise Richardson has developed a new body of work exploring rural mythology and storytelling. On the hunt is a continuation of her research into the existence of the Phantom Cat and emerges from a sense of vulnerability that arises when alone in the bush. 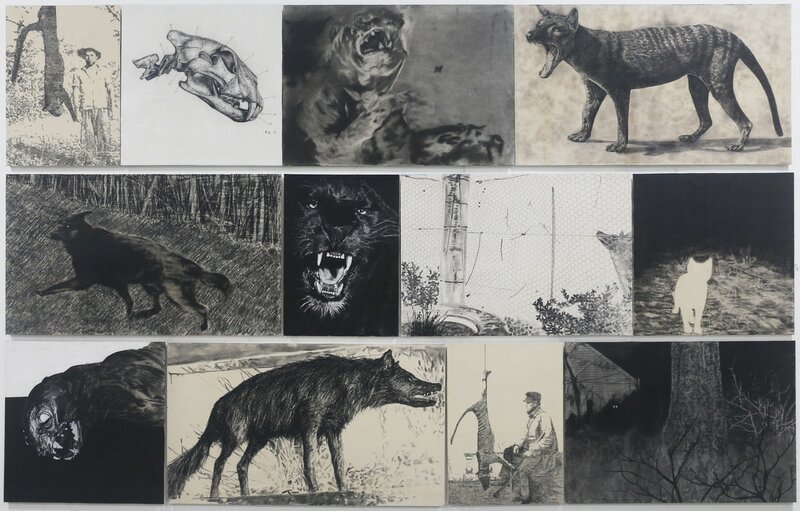 Richardson’s drawings delve into the global mystery of a large feline cryptid stalking rural areas and conspiracy theories imposed on the natural environment. 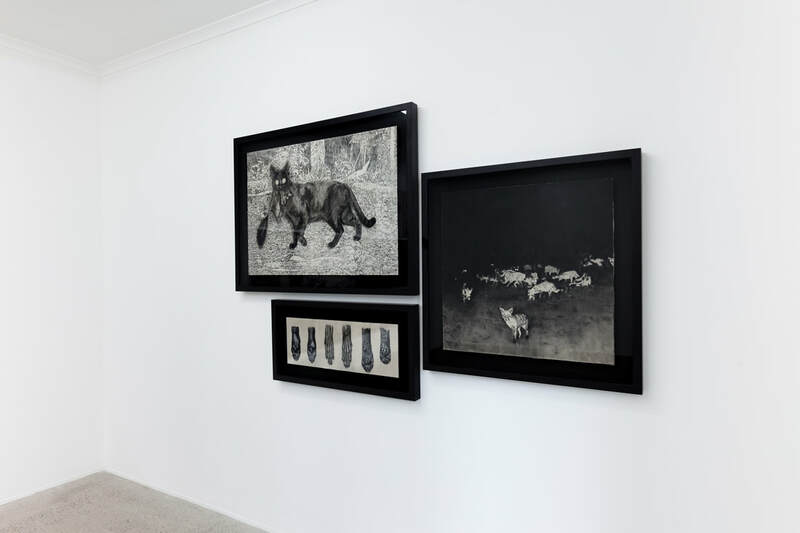 Operating in the area between fiction and reality On the hunt originates from Richardson’s personal experience on the land as the sixth generation to live and work on a 3000 acre beef cattle farm in Western Australia. Her work considers rural mythology, rendering animal archetypes as tropes of national and personal identity, revealing how our relation to place (and nature more broadly) is filtered and shaped through layers of history, storytelling and imagination. Anna Louise Richardson, On the hunt (installation views Galerie pompom), 2017. Photo: Docqment. Anna Louise Richardson, Ruiz's Panther, 2017, charcoal on cement fibreboard, 70 x 50 cm. Anna Louise Richardson, Specimen, 2017, charcoal and oil paint on cement fibreboard, 70 x 70 cm. Anna Louise Richardson, Jaws, 2017, charcoal on cement fibreboard, 70 x 100 cm. 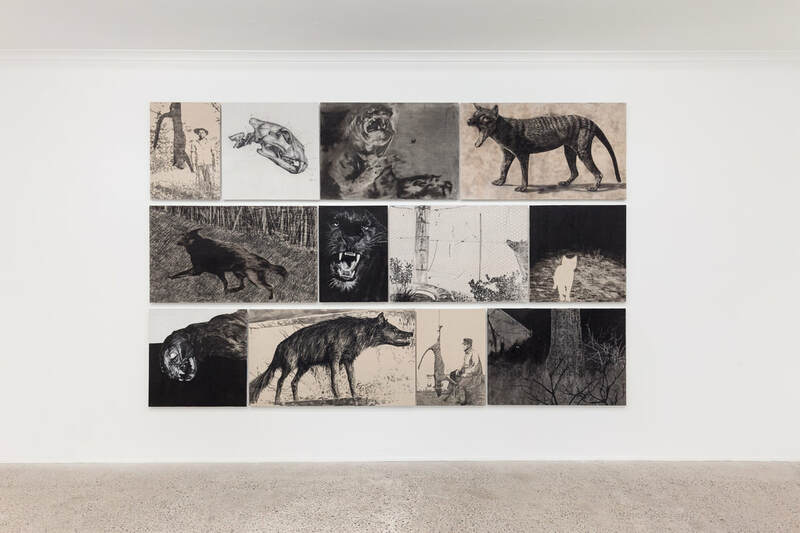 Anna Louise Richardson, Thylacine, 2017, charcoal on charred cement fibreboard, 70 x 120 cm. 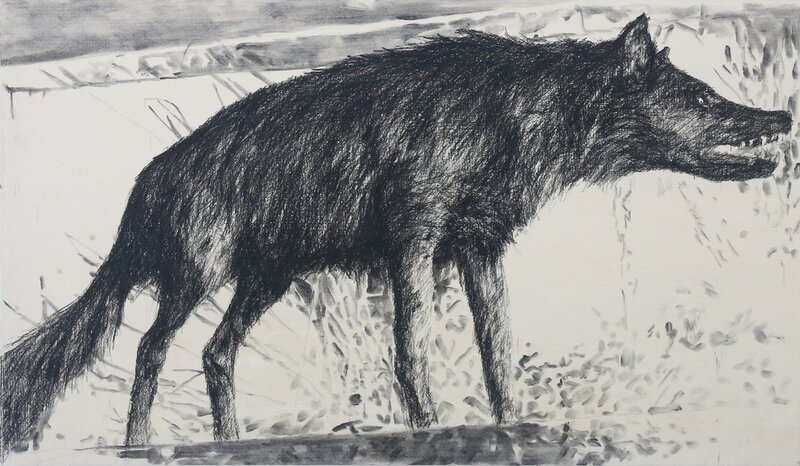 Anna Louise Richardson, Black Dog, 2017, charcoal and glow in the dark acrylic on cement fibreboard, 70 x 120 cm. 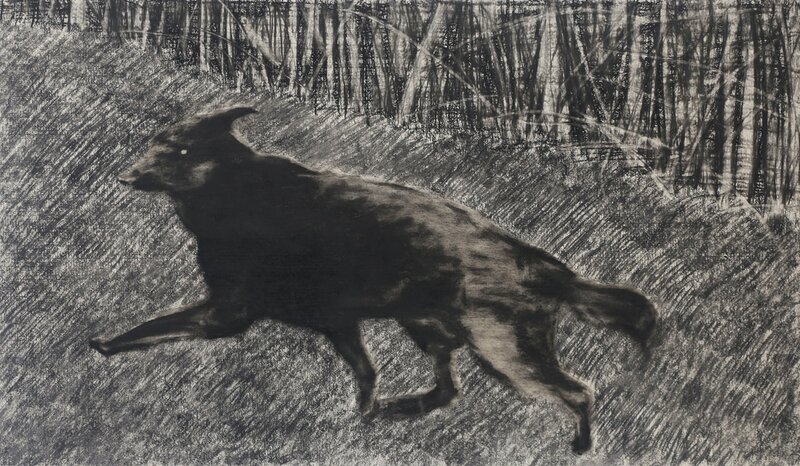 Anna Louise Richardson, ​Black Panther, 2017, charcoal and pastel on cement fibreboard, 70 x 50 cm. Anna Louise Richardson, Fence, 2017, charcoal and oil paint on cement fibreboard, 70 x 100 cm. Anna Louise Richardson, Skinned Cat, 2017, charcoal and pastel on cement fibreboard, 70 x 70 cm. 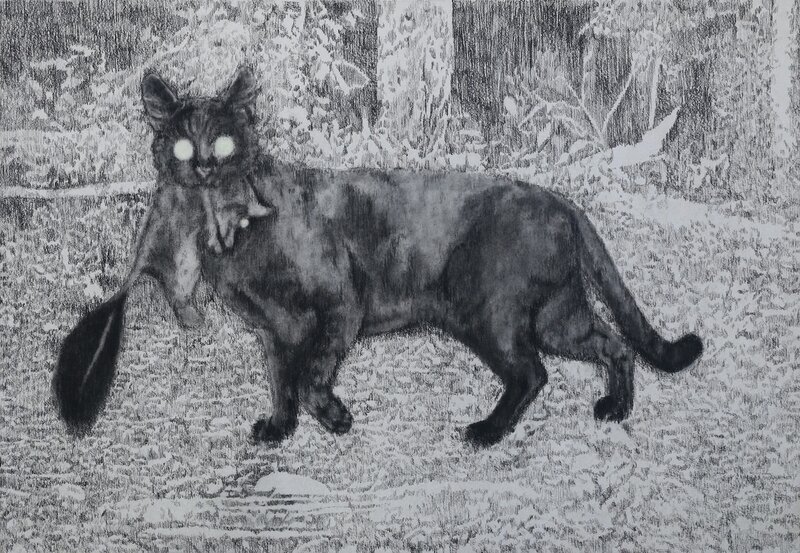 Anna Louise Richardson, Phantom Cat, 2017, charcoal on cement fibreboard, 70 x 70 cm. Anna Louise Richardson, The Beast, 2017, charcoal on cement fibreboard, 70 x 120 cm. 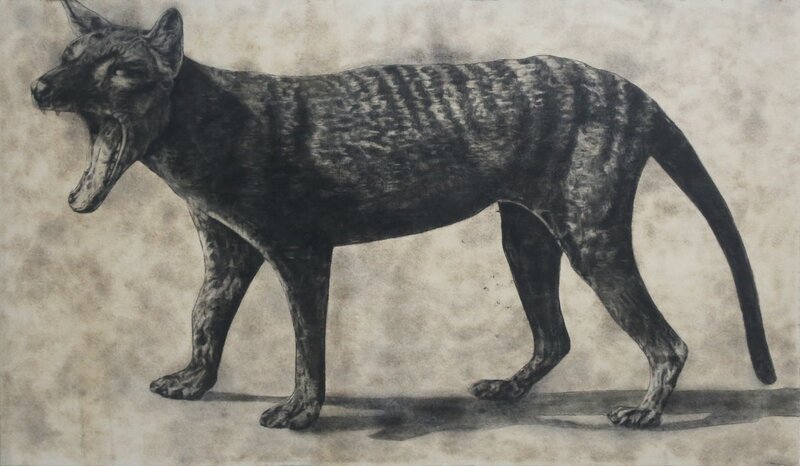 Anna Louise Richardson, Tasmanian Tiger, 2017, charcoal on cement fibreboard, 70 x 50 cm. Anna Louise Richardson, Trespasser, 2017, charcoal and pastel on cement fibreboard, 70 x 100 cm. On the hunt is supported by the Government of Western Australia through the Department of Culture and the Arts via the Young People and the Arts Fellowship from the WA Department of Culture and the Arts.